It took the better part of a year for Kristy Wolterbeek to get her first amateur mixed martial arts bout under her belt. Cancellation after cancellation made it feel as if the opportunity would never came, but it finally did. She would earn a unanimous decision over Sandra Chheng in August. Now making her Maverick MMA debut against Natalie Schlesinger (0-1), Wolterbeek hopes to keep the momentum moving forward. Her opponent is coming off a unanimous decision loss, and she too will be eager for a win. The Maverick MMA 3 fight will take place September 30 at the Sherman Theater in Stroudsburg, PA. We caught up with Wolterbeek at the Maverick MMA 3 open workouts to talk about her future in MMA. Can you talk about the nerves leading up to your first fight? You had a handful of fights fall off. What did it finally feel like to get into the cage for the first time? What did you learn about yourself as a fighter after having the opportunity to compete? “I learned that I had it, you know? I had never had a fight before. I never knew what it was like in a real situation, in real competition, aside from sparring. So, I learned that I had it. I had a great outcome. I worked my hands a lot. And I learned that I need to work on my takedown defense and jiu-jitsu as well. My striking was superior. I need to work the ground game more for this fight. I’m at Pure MMA under the Main Brothers for my ground game. Have you seen any progression in your ground game since working with Pure MMA? What do you know about Natalie Schlesinger as an opponent? Your social media is flooded with workout videos. Would it be safe to say you are a cardio freak? 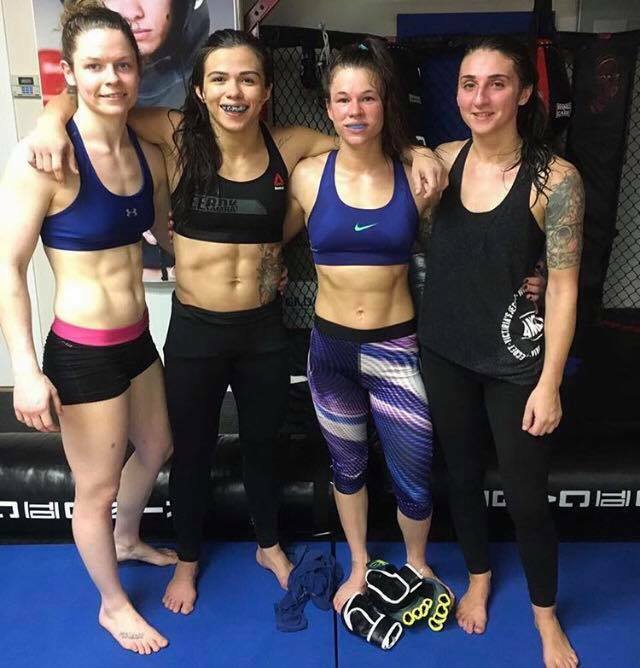 You trained with Claudia Gadelha when she was in New Jersey. Do you two still talk and how do you see her fight this coming weekend going down? Speaking of weight cuts, how much weight do you typically need to cut for a fight? You often hear about women retaining more water weight than men. Do you get frustrated when the weight doesn’t come off? You’ve been known to train your stand up technique with coach Don Cioffi. How’s that going for you?